Here, a new method that allows the conversion of adult skin fibroblasts into insulin-secreting cells is presented. This technique is based on epigenetic conversion, does not involve the use of retroviral vectors nor the acquisition of a stable pluripotent state. It is therefore highly promising for translational medicine applications. Brevini, T. A., Pennarossa, G., Maffei, S., Zenobi, A., Gandolfi, F. Epigenetic Conversion as a Safe and Simple Method to Obtain Insulin-secreting Cells from Adult Skin Fibroblasts. J. Vis. Exp. (109), e53880, doi:10.3791/53880 (2016). Regenerative medicine requires new, fully functional cells that are delivered to patients in order to repair degenerated or damaged tissues. When such cells are not readily available, they can be obtained using different approaches that include, among the many, reprogramming and trans-differentiation, with advantages and limitations that are specific of the different techniques. Here a new strategy for the conversion of an adult mature fibroblast into an insulin-secreting cell, arbitrarily designated as epigenetic converted cells (EpiCC), is described. The method has been developed, based on the increasing understanding of the mechanisms controlling epigenetic regulation of cell fate and differentiation. In particular, the first step uses an epigenetic modifier, namely 5-aza-cytidine, to drive adult cells into a "highly permissive" state. It then takes advantage of this brief and reversible window of epigenetic plasticity, to re-address cells toward a different lineage. The approach is designated "epigenetic cell conversion". It is a simple and robust way to obtain an efficient, controlled and stable cellular inter-lineage switch. Since the protocol does not involve the use of any gene transfection, it is free of viral vectors and does not involve a stable pluripotent state, it is highly promising for translational medicine applications. A fundamental objective of regenerative medicine is the generation of new, functional cells that can be used to repair or replace damaged, degenerated tissues. Remaking easily available adult cells into new ones, by converting them from one cell type to another, is a particularly appealing approach, especially when the required cell population is not abundant or difficult to access. However, adult cells are remarkably stable. They acquire their differentiated state through a gradual restriction in their options and, once they reach the mature terminal specialization, they stably retain it 1. In the last years a number of protocols have been developed, that enable the reprogramming to pluripotency of a somatic cell (iPS) achieved through the forced expression of a set of transcription factors 2,3. Alternatively, cell conversion can be obtained by direct lineage transdifferentiation, introducing a single 4 or a combination of transcription factors 5-7. This strategy does not involve the transition through a de-differentiated state but requires high expression of the specific transcription factors 8. We have recently developed a conversion protocol based on the brief exposure of adult cells to the demethylating properties of the cytidine analog 5-azacytidine (5-aza-CR), a well-characterized DNA methyltransferase inhibitor. The demethylation step is immediately followed by a specific differentiation protocol 9-11 that allows to obtain the required terminal phenotype. This method is able to convert mature, differentiated cells into cells of a different lineage and has the substantial advantage to avoid both the use of viral vectors and the transfection of any exogenous transcription factors. The acquisition of a stable pluripotent state, and the related increased susceptibility to cell instability is also avoided. The detailed protocol that allows the conversion of adult human skin fibroblasts into fully functional insulin-secreting cells is presented here. However, it is worth noting that the technique has been applied to different cell types and has generated positive results, when addressing cells towards various differentiation pathways. Furthermore, epigenetic conversion has been successfully used in the human and porcine species 9-13 as well as in the dog (manuscript submitted) suggesting a wide efficacy and robustness of the approach. Note: All the procedures described below must be performed under laminar flow hood in sterile conditions. Make sure that all culture procedures are carried out on thermostatically controlled stages and cells are maintained at 37 °C throughout their handling. Dissolve 0.1 g of porcine gelatin in 100 ml of water (final concentration 0.1%). Sterilize solution with autoclave. Add 1.5 ml of sterile 0.1% porcine gelatin to 35 mm Petri dishes. Wait 2 hr to coat, maintaining them at room temperature. Note: Human skin biopsies are collected by excision under local anesthesia from an avascular area of the anterior aspect of the forearm and stored in Dulbecco's Phosphate Buffered Saline (PBS) supplemented with 2% antibiotic antimycotic solution at +4 °C prior to use. Wash biopsies with new PBS supplemented with 2% antibiotic antimycotic solution. Place biopsies in a 100 mm Petri dish and cut into approximately 2 mm3 fragments with sterile scalpels. Remove the coating solution excess immediately prior to plating fragments. Place 5-6 skin fragments into the pre-coated 35 mm Petri dish. Prepare fibroblast culture medium: 77% Dulbecco's Modified Eagle Medium (DMEM) high glucose, 20% Fetal Bovine Serum (FBS), 1% L-Glutamine solution and 2% antibiotic antimycotic solution. Add a droplet of fibroblast medium over each fragment (usually 100 µl per fragment) and culture them at 37 °C in 5% CO2. After 24 hr, add 500 µl of fibroblast culture medium over the fragments to keep them wet at 37 °C in 5% CO2. Change the medium with a pipette at least once every 48 hr. After 6 days of incubation, remove tissue fragments carefully and discard them. Note: After 6 days, fibroblasts start to grow out of the tissue fragments and begin to form a cell monolayer. Refresh medium, add 2 ml of fibroblast culture medium and continue cell monolayer culture at 37 °C in 5% CO2 incubator. For passaging, aspirate fibroblast culture medium from tissue culture dishes. Wash cells three times with 4 ml of PBS supplemented with 1% antibiotic antimycotic solution. Add a thin layer (10% of the culture medium volume) of trypsin-EDTA solution (0.5 g/L porcine trypsin and 0.2 g/L EDTA) and incubate at 37 °C until cell monolayer begins to detach from the bottom of the tissue culture dish and cells dissociate. Dilute cell suspension with 9 parts of fibroblast culture medium to neutralize trypsin action. Centrifugation is not necessary. Plate cells in new culture dishes (without gelatin) and culture at 37 °C in 5% CO2 incubator. Keep the passage ratio between 1:2 and 1:4, depending on growth rate. When cells reach around 80% confluence, passage them (usually twice per week). Add 0.26 ml/cm2 of 0.1% porcine gelatin (prepare as described in 1.1) to cell culture dishes. Wait 2 hr to coat. Remove the coating solution excess 10-30 min prior to plating fibroblasts. Remove fibroblast culture medium from culture dishes. Wash cells three times with PBS supplemented with 1% antibiotic antimycotic solution. Dilute cell suspension with 9 parts of fibroblast culture medium to neutralize trypsin action. Count cells using a counting chamber under a microscope at room temperature. Calculate the required volume of fibroblast culture medium to resuspend cells, to obtain a cell concentration of 7.8 x 104 fibroblasts/cm2. This will depend on the specific type of chamber used. Centrifuge cell suspension at 150 g for 5 min at room temperature. Remove supernatant and resuspend cells with the previously calculated volume of fibroblast culture medium. Plate cells on 0.1% gelatin pre-coated dishes and culture them for 24 hr at 37 °C in 5% CO2 incubator. Prepare 5-aza-CR stock solution by dissolving 2.44 mg of 5-aza-CR in 10 ml of DMEM high glucose medium. Sterilize by filtration. Prepare 5-aza-CR stock immediately prior to use. Dilute 1 µl of 5-aza-CR stock solution in 1 ml of fibroblast culture medium (final concentration 1 µM). To increase cell plasticity, 24 hr after cell plating (subheading 3.8), remove culture medium from seeded fibroblasts and add 1 µM 5-aza-CR stock solution and culture for 18 hr at 37 °C in 5% CO2 incubator. Prepare fresh Human Pluripotent (HP) medium as described in Table 1. After incubation with 1 µM 5-aza-CR, remove medium and wash cells three times with PBS to ensure that 5-aza-CR is rinsed away. Incubate 5-aza-CR treated fibroblasts with HP medium for 3 hr (recovery period) at 37 °C in 5% CO2. After the recovery period, remove medium, wash three times with PBS. To monitor the efficiency of 5-aza-CR treatment, check in this step for the presence of morphological changes (detailed in Results section). Cells lose the typical elongated morphology of fibroblasts and acquire a round or oval shape, becoming smaller in size, with enlarged nuclei. Prepare Pancreatic Basal Medium as described in Table 2. Prepare activin A stock solution: dissolve 5 µg of activin A recombinant human protein in 166.6 µl of sterile water. Culture 5-aza-CR treated fibroblasts in 0.26 ml/cm2 of Pancreatic Basal Medium, supplemented with 1 µl/ml activin A stock solution (see 5.1.2) for 6 days at 37 °C in 5% CO2 incubator. Change medium daily. Prepare retinoic acid stock solution by adding 16.6 ml of dimethyl sulfoxide (DMSO) to 50 mg of retinoic acid. Culture cells in 0.26 ml/cm2 of Pancreatic Basal Medium supplemented with 1 µl/ml activin A stock solution (see 5.1.2) and 1 µl/ml retinoic acid stock solution (see 5.2.1) for 2 days at 37 °C in 5% CO2. Change medium daily. Culture cells in 0.26 ml/cm2 of Pancreatic Basal Medium supplemented with 1% (v/v) Insulin-Transferrin-Selenium (ITS), 2% (v/v) B27 and 0.1% (v/v) Recombinant Human FGF basic (bFGF) stock solution (see Table 1) at 37 °C in 5% CO2 incubator. Change the medium daily for the first 15 days. From day 16 onward, refresh medium every other day, under a microscope, since forming aggregate cells may detach from the bottom of the culture dish. Skin biopsies were cut in small fragments and placed in gelatin pre-coated dishes. After 6 days, fibroblasts started to grow out of the tissue fragments and formed a cell monolayer (Figure 1A). Cells showed a typical elongated shape and, as expected, displayed a uniform immune-positivity for the fibroblast specific marker vimentin (Vim, Figure 1B). To obtain a successful epigenetic conversion of fibroblasts into insulin-secreting cells, we increased their plasticity using the de-methylating agent, 5-aza-CR. Human fibroblasts were plated on 0.1% gelatin pre-coated dishes at a concentration of 7.8 x 104 fibroblasts/cm2. Twenty-four hr after seeding, cells were incubated with 1 µm 5-aza-CR for 18 hr. At the end of this treatment, an extensive change of cell phenotype was visible (Post 5-aza-CR, Figure 2A). The typical elongated morphology of untreated fibroblasts (T0, Figure 2A), was replaced by a round or oval shape and cell size became considerably smaller. Cytoplasm was granular, flattened, and cells were adherent to the culture surface. Nuclei appeared larger and vacuolated, as a consequence of the relaxed chromatin structure. In our experience, the presence of these morphological changes is essential and must be carefully monitored as a marker for the efficiency of 5-aza-CR treatment. After 18 hr exposure to 5-aza-CR, a sharp decrease of global DNA methylation was also evident and was clearly demonstrated by the diminished intensity of 5-methylcytidine immunostaining (Figure 2B). 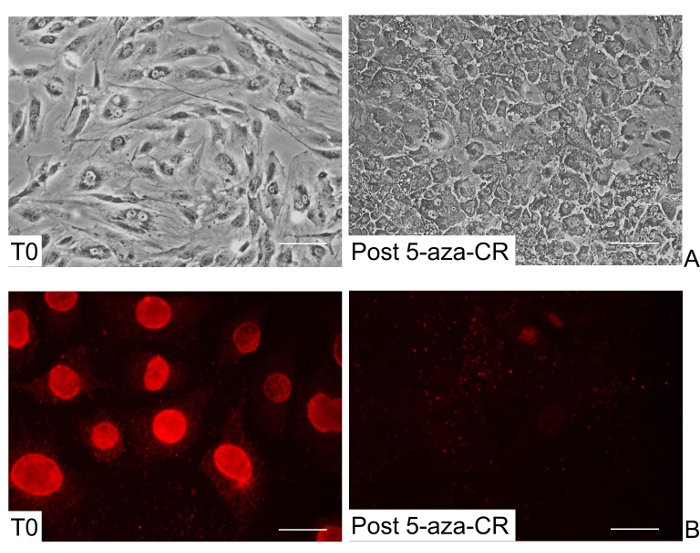 To induce pancreatic differentiation, 5-aza-CR treated fibroblasts were exposed to a three-step protocol for pancreatic induction, immediately after the 3 hr recovery period. During the first step, cells were cultured for 7 days in Pancreatic Basal Medium supplemented with activin A to promote endoderm commitment. In this interval, cells further flattened and gradually began to organize in clusters (Day 7, Figure 3A). Subsequently, pancreatic lineage differentiation was promoted with the addition of retinoic acid for 2 days. In response to this treatment, cells rearranged in a reticular pattern and grew in clearly distinguishable cell aggregates (Day 10, Figure 3A). The clustering formation process increased with time and was further stimulated by the third and last step, which consisted of cell exposure to B27, bFGF and ITS. This led to the recruitment of a growing number of cells that aggregated in large 3D colonies (Day 20, Figure 3A). Around day 36, these colonies appeared as distinct round structures reminiscent of typical pancreatic islets in vitro (Day 36, Figure 3A). The acquisition of the new EpiCC phenotype was accompanied by a gradual increase of the global DNA methylation levels that returned to those observed in untreated fibroblasts (5 mC Day 36 Figure 3B). After 36 days of pancreatic induction, the efficiency of epigenetic conversion was also demonstrated by the expression of typical mature pancreatic markers, which were originally undetectable in untreated fibroblasts (T0, Figure 3B). 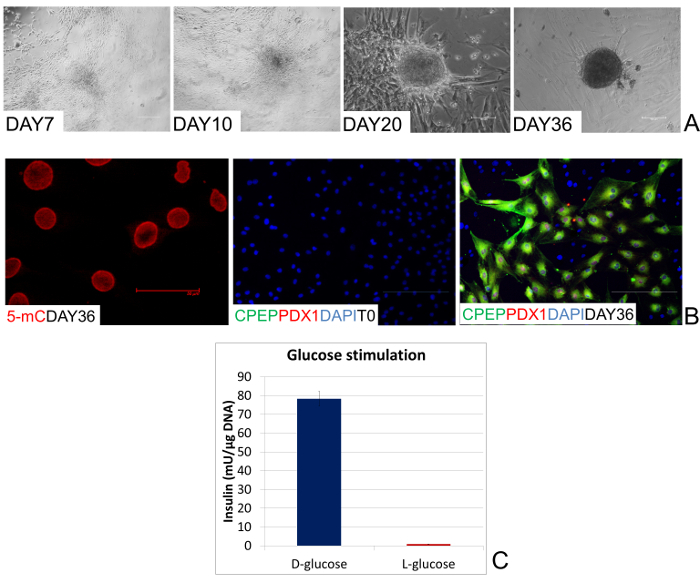 The co-localization of C-peptide (C-PEP) with Pancreatic and duodenal homeobox 1 (PDX1) confirmed the bona fide nature of EpiCC as insulin-producing ones (Day 36, Figure 3B). Furthermore, converted cell functional phenotype was demonstrated by their ability to respond to 20 mM glucose exposure, which represents the physiological triggering compound. More in detail, EpiCC actively secreted insulin in the culture medium after 1 hr of D-glucose stimulation. No release was detectable after exposure to an equimolar amount of L-glucose (Figure 3C). Figure 1: Isolation and characterization of human skin fibroblasts. 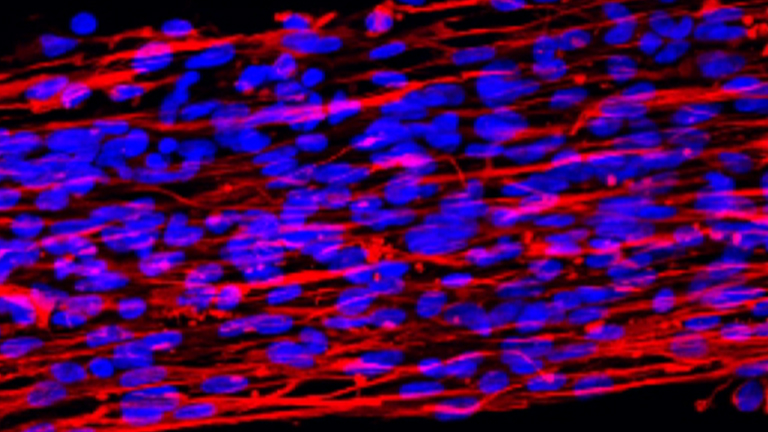 (A) Representative image of fibroblasts growing out of the tissue fragments. (B) Fibroblasts display a uniform immune-positivity for their specific marker vimentin (Vim). Nuclei are stained with DAPI. (Scale bars, 100 µm). Please click here to view a larger version of this figure. Figure 2: Morphological and methylation changes of human skin fibroblasts after 5-aza-CR treatment. (A) Representative images of untreated fibroblasts showing elongated shape (T0), and 5-aza-CR treated fibroblasts displaying a round or oval morphology, granulated cytoplasm, and enlarged and vacuolated nuclei (Post 5-aza-CR). (Scale bars, 100 µm). (B) A decrease of global DNA methylation is detectable after 5-aza-CR treatment (Post 5-aza-CR). (Scale bars, 50 µm). Please click here to view a larger version of this figure. Figure 3: Morphological and functional changes during epigenetic conversion. (A) Representative pictures of the morphological changes taking place during endocrine pancreatic differentiation. After 7 days of induction, human cells gradually organize in clusters (Day 7). In response to the addition of retinoic acid, they rearrange in a reticular pattern and cluster in distinguishable aggregates (Day 10). These formations progress with time, recruiting cells and aggregating in large 3D colonies (Day 20). Finally, colonies become spherical structures that tend to detach and float freely in the culture medium, reminiscent of typical pancreatic islets in vitro (Day 36). (Scale bars, 100 µm). (B) After 36 days of pancreatic induction, global DNA methylation levels of human EpiCC return to those observed in untreated fibroblasts (5 mC Day 36). (Scale bar, 50 µm). Co-localization of PDX1 with C-PEP is detectable at the end of the conversion period (Day 36), while these endocrine pancreatic markers are completely absent in untreated fibroblasts (T0). (Scale bars, 100 µm). (C) EpiCC insulin release in response to 20 mM D-glucose and 20 mM L-glucose exposure. Bars represent the mean ± SD of three independent replicates. Please click here to view a larger version of this figure. BSA stock 1% Preparation of BSA stock: dissolve 250 mg in 50 ml of water. Sterilize by filtration and store at +4 °C. The present manuscript describes a method that allows the conversion of human skin fibroblasts into insulin-producing cells, through a transient and brief exposure to 5-aza-CR, followed by a tissue specific induction protocol. This approach allows a switch from mesoderm to endoderm related cells, without the forced expression of transcription factors or microRNAs nor the acquisition of a stable pluripotent state, that makes cells more unstable and prone to mistakes 14. In the first step, cell plasticity is increased thanks to a synthetic epigenetic modifier that induces a transient, reversible permissive state in terminally differentiated cells. In particular, 5-aza-CR was used in order to cause a decrease in global methylation of skin fibroblast cells. 5-aza-CR is known to directly inhibit methyl-transferase activity and to prevent de novo methylation in newly synthesized DNA. Because of its effect, this molecule has been previously used to reactivate silent genes, as well as to modify the differentiation states of eukaryotic cells 15,16. Consistent with this, post 5-aza-CR skin fibroblasts showed a global DNA demethylation (Figure 2A), indicating 5-aza-CR ability to increase plasticity in the cells used for the present experiments. This is also in agreement with the observation that 5-aza-CR facilitates expression of the high plasticity-related marker Oct-4 in neurosphere cells (NSCs) 17. However, it is interesting to note that post 5-aza-CR skin fibroblasts revert to their original phenotype after removal of 5-aza-CR. Indeed, we previously demonstrated that fibroblasts returned to their original culture medium, down regulated expression of the pluripotency-related factors 9,10, indicating that the higher plasticity state acquired, in response to the epigenetic modifier, is transient, reversible and does not involve permanent modifications of the cells. Marked changes in cell morphology accompanied the induction of a higher plasticity state (Figure 2A). The typical elongated cell bodies of the untreated fibroblast cells was replaced by round or oval shaped cells that presented smaller dimensions and an increased nuclei volume, which appeared larger than that of differentiated cells. Niwa correlated this nuclear enlargement to a relaxed chromatin structure described as a pluripotency-related feature 18. The presence of vacuolated nuclei and granular cytoplasm, as well as an increased flatten morphology, were evident. All the morphological changes described can be practically used as a marker for successful completion of the first part of the conversion protocol; in our experience when the changes are present, 5-aza-CR has indeed helped cells to acquire a more permissive state. It is possible to take advantage of this transient "high permissivity time-window" to drive cells toward a completely different phenotype. The present protocol demonstrates that post 5-aza-CR fibroblasts can be re-addressed to pancreatic beta cell-like cells, in response to a specific differentiation medium. The protocol used allow cells to switch from a mesoderm derived cell type to a cell population belonging to the endoderm lineage. Insulin, which was originally undetectable in untreated skin fibroblasts, was positive at the end of the differentiation protocol (Figure 3B). This was accompanied by the simultaneous expression of other factors, such as PDX1, involved in the differentiation of the whole of the pancreas - its exocrine, endocrine, and ductal cell populations, beside the specific beta-cell lineage. This is consistent with previous work on mouse embryonic stem cells (ESC) indicating that a proper differentiation into beta-cells was achieved only when immature cells were layered with other endocrine cells 19, suggesting that the local micro-environment provided by the pancreatic islet of Langerhans architecture has a strong functional role. Indeed, EpiCC achieved a mature differentiated phenotype and showed the ability to respond to 20 mM glucose exposure (Figure 3). Insulin was actively secreted in the culture medium after 1 hr of D-glucose stimulation, confirming the bona fide nature of EpiCC as insulin-producing ones (Figure 3C). A distinct requirement for a successful procedure is the rigorous maintenance of cells at 37 °C, at all steps, including their handling under the sterile laminar flow and the microscope. In our experience, it is also highly recommended to prepare reagents freshly, prior to their use in culture and to refresh medium strictly according to the protocol. This operation must be carried out under a microscope since the forming aggregate cells may detach from the bottom of the culture dish and lost during medium changes. The epigenetic conversion protocol has also been successfully applied to the porcine species as well as to the dog (manuscript submitted), using the same cell number/cm2 and de-methylating agent concentration described for humans. In conclusion, a protocol that allows the conversion of skin fibroblasts into another cell type is presented here. The strategy described has the advantages of an epigenetically-based cell conversion: namely the possibility to avoid a pluripotent state that could leave behind cells capable of causing cancer; the elimination of exogenous genetic factors that could cause lingering changes in the cells. These advantages make the present approach highly promising for translational medicine applications and allows for patient specific cell therapy. This work was funded by Carraresi Foundation and European Foundation for the Study of Diabetes (EFSD). GP is supported by a post-doc fellowship of the University of Milan. The Authors are members of the COST Action FA1201 Epiconcept: Epigenetics and Periconception environment and the COST Action BM1308 Sharing advances on large animal models (SALAAM). TALB is member of the COST Action CM1406 Epigenetic Chemical Biology (EPICHEM). Zhou, Q., Brown, J., Kanarek, A., Rajagopal, J., Melton, D. A. In vivo reprogramming of adult pancreatic exocrine cells to beta-cells. Nature. 455, (7213), 627-632 (2008). Davis, R. L., Weintraub, H., Lassar, A. B. Expression of a single transfected cDNA converts fibroblasts to myoblasts. Cell. 51, (6), 987-1000 (1987). Vierbuchen, T., et al. Direct conversion of fibroblasts to functional neurons by defined factors. Nature. 463, (7284), 1035-1041 (2010). Caiazzo, M., et al. Direct generation of functional dopaminergic neurons from mouse and human fibroblasts. Nature. 476, 224-227 (2011). Huang, P., et al. Induction of functional hepatocyte-like cells from mouse fibroblasts by defined factors. Nature. 475, 386-389 (2011). Marro, S., et al. Direct Lineage Conversion of Terminally Differentiated Hepatocytes to Functional Neurons. Cell Stem Cell. 9, (4), 374-382 (2011). Pennarossa, G., et al. Brief demethylation step allows the conversion of adult human skin fibroblasts into insulin-secreting cells. Proc Natl Acad Sci U S A. 110, (22), 8948-8953 (2013). Pennarossa, G., et al. Reprogramming of Pig Dermal Fibroblast into Insulin Secreting Cells by a Brief Exposure to 5-aza-cytidine. Stem Cell Rev. 10, (1), 31-43 (2014). Brevini, T. A., et al. Morphological and Molecular Changes of Human Granulosa Cells Exposed to 5-Azacytidine and Addressed Toward Muscular Differentiation. Stem Cell Rev. 10, (5), 633-642 (2014). Thoma, E. C., et al. 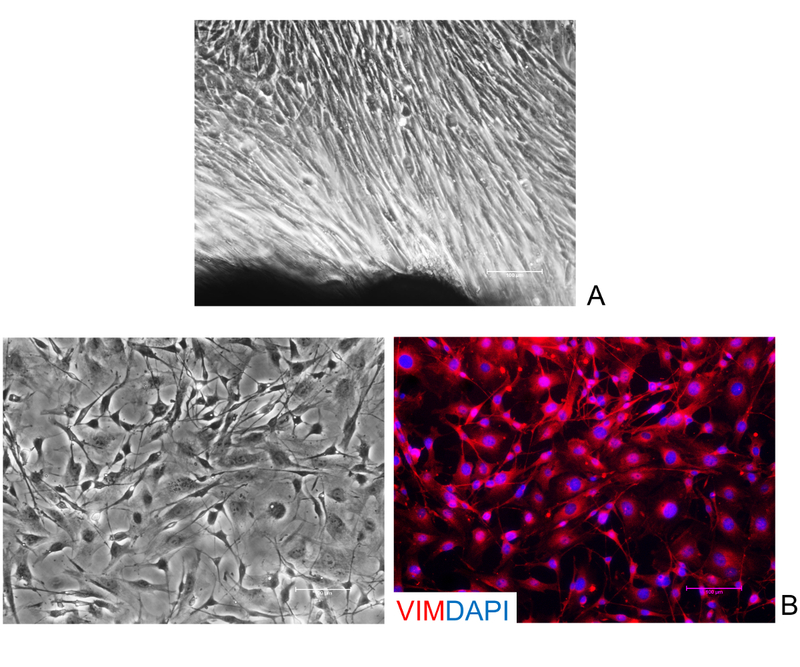 Chemical conversion of human fibroblasts into functional Schwann cells. Stem Cell Reports. 3, (4), 539-547 (2014). Mirakhori, F., Zeynali, B., Kiani, S., Baharvand, H. Brief azacytidine step allows the conversion of suspension human fibroblasts into neural progenitor-like cells. Cell J. 17, (1), 153-158 (2015). Plath, K., Lowry, W. E. Progress in understanding reprogramming to the induced pluripotent state. Nat Rev Genet. 12, (4), 253-265 (2011). Taylor, S. M., Jones, P. A. Multiple new phenotypes induced in 10T1/2 and 3T3 cells treated with 5-azacytidine. Cell. 17, (4), 771-779 (1979). Glover, T. W., Coyle-Morris, J., Pearce-Birge, L., Berger, C., Gemmill, R. M. DNA demethylation induced by 5-azacytidine does not affect fragile X expression. Am J Hum Genet. 38, (3), 309-318 (1986). Do, J. T., Scholer, H. R. Nuclei of embryonic stem cells reprogram somatic cells. Stem Cells. 22, (6), 941-949 (2004). Niwa, H. How is pluripotency determined and maintained? Development. 134, (4), 635-646 (2007). Kahan, B. W., et al. Pancreatic precursors and differentiated islet cell types from murine embryonic stem cells: an in vitro model to study islet differentiation. Diabetes. 52, (8), 2016-2024 (2003).